LAHORE: (Thursday, July 19, 2018): Punjab Higher Education Commission Chairman Prof Dr Nizamuddin has said that our sociologists, anthropologists, archeologists, historians must work collectively to define Pakistani culture through understanding cultural practices and cultural processes. He was addressing a seminar organized by Punjab University Institute of Social and Cultural Studies in collaboration with Punjab Higher Education Commission and AIPS at ISCS auditorium here on Wednesday. PU Vice Chancellor Prof Niaz Ahmad, Dean Faculty of Behavioral and Social Sciences Prof Dr Zakria Zakar, PHEC Director General Shahid Soroya, Professor Joel Gordon from Arkansas University, USA, FC College’s Prof Dr Tahir Kamran, faculty members and a large number of students were present on the occasion. Addressing the seminar, Dr Nizam said that sub cultures and popular cultures had much importance in Pakistan and the United States. He said that we could not define our cultures without understanding structural problems. He said that devolution was a political process which helped understand how local systems operated and we could not define our culture without understanding the phenomena. He said that our research must be relevant to public policies and PHEC would support such research projects. In his address, Prof Niaz Ahmed said that the country could not progress without development in social sciences. He said that ethics and values were necessary for every human being. He said that we needed to understand organization’s management system, adopt latest technologies and comprehend social system for moving forward. 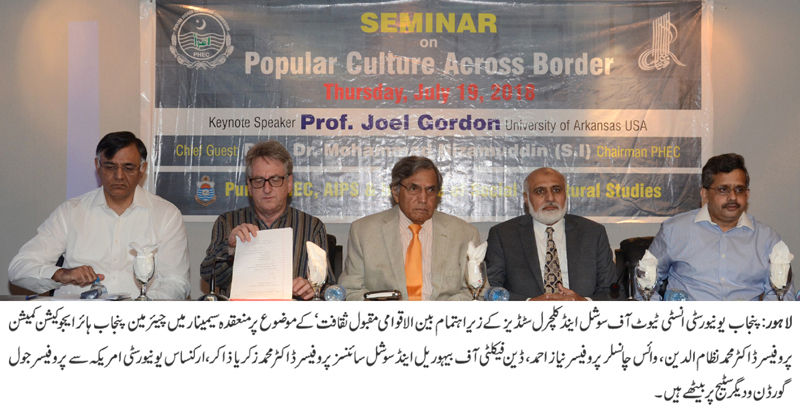 Dr Joel Gordon stressed the need to do research on Pakistan Television to understand Pakistan’s popular culture. He said that film and TV had important role in promotion of popular culture across borders. Prof Dr Tahir Kamran detailed connection among popular culture, modernity and ideology. Prof Dr Zakria Zakar thanked the delegates and said that there were new dimensions to know about culture and we must create new knowledge in this field using multi-disciplinary approach.